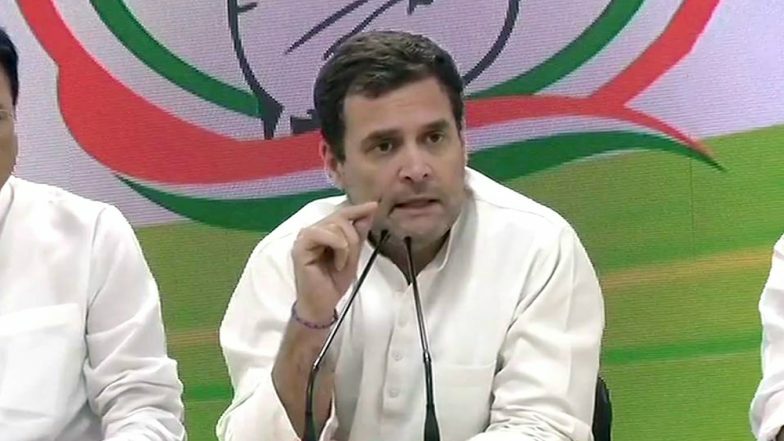 New Delhi, March 25: Congress President Rahul Gandhi in a press conference on Monday said that those earning below Rs 12,000 annually will get minimum income support of Rs 6,000 per month. The Congress President added that the move to provide Rs 72,000 annually to poor families will benefit 20 percent of the poor population in India. Gandhi said that the minimum income of an Indian per year must at least be Rs 12,000 per month. Lok Sabha Elections 2019: Will Keep a Telescopic View on Rahul Gandhi's Income in Election Nomination, Says BJP. Rahul Gandhi claimed that the move will benefit over 25 crore people. Gandhi called it the biggest minimum income support scheme not just in India but also all over the world. Narendra Modi, Rahul Gandhi Firm Up Narratives in Election Criss-Cross. "Wherever I go everyone asks me that what will be the minimum income guarantee programme. What will be its strength and how many people will it help?" said Gandhi. "For the past 5 years the citizens of the nation had to go through a lot of hardships, so the INC India party has decided to give justice to the poor people of the country," said Gandhi. Gandhi said the Congress has studied the fiscal implications of the scheme and consulted renowned economists and experts before finalising the scheme. “It is an extremely powerful, ground-breaking and well-thought through idea. We have consulted many economists on the scheme,” he said.